I got this idea from Ines over on the Frau Heuberg blog. Total genius. Almost every time you buy drinks in Germany (from juice to water to alcohol) you also receive a crate like this. This is handy for bringing drinks home and then later returning the bottles to the recycling center at the store. Or, if you're like me, it's handy to keep your tubes of wrapping paper organized. My husband reminded me we had paid a deposit for the crate, but we agreed it was cheaper to keep the crate then pay for some fancy container to do the same job. Since I keep my hodgepodge of (gosh, I should purge some of that) paper in the pantry, I suppose it's OK if it doesn't look all dolled up like this one. 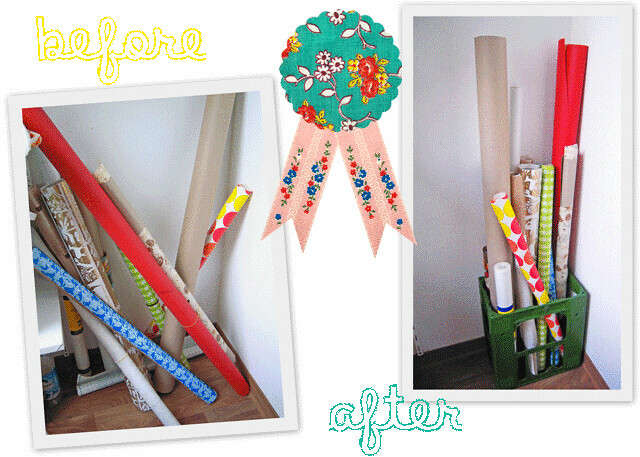 What's your favorite re-purposing trick to organize? Love it! Great idea. I think I'll ask my hubby to do the same... let's see if he brings up the issue of deposit too. Last year my husband used one of our crates as a launch pad for our New Year's rockets. Not such a good idea... Took me forever to get it clean so I could take it back. Hmmm, I use canning jars as a tissue paper dispenser. I think you just gave me a post idea. :) Thanks. Not a wrapping paper idea but.....When you buy wine by the case, keep the case and use it to store your Christmas tree ornaments. I just wrap in tissue and store the more fragile ones near the inside. Here in the states, at TJoes, you can ask them for an empty wine case. I've thought of buying an plastic ornament holder but I like my free storage so I never splurge. I'd rather buy more ornaments with the money I save!